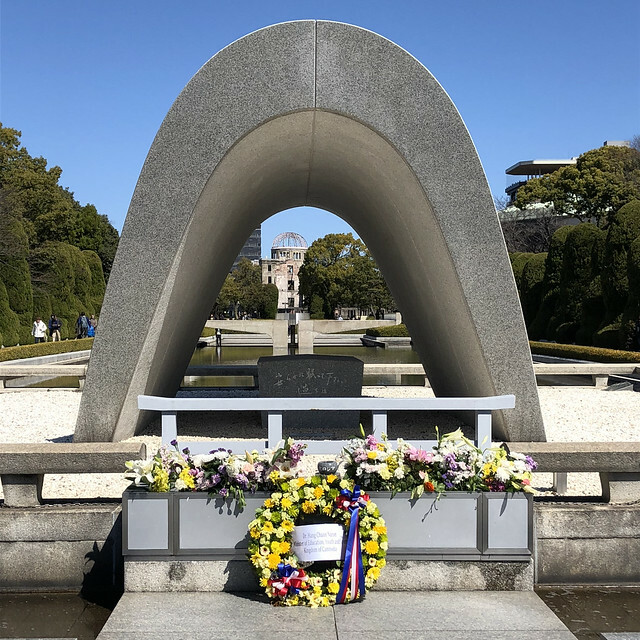 We left Kyoto early in the morning on Saturday to meet our friends for a weekend in Hiroshima. We stopped at Starbucks for a quick pick-me-up before heading to the Peace Memorial Park, for what we knew would be a tough, emotional day. 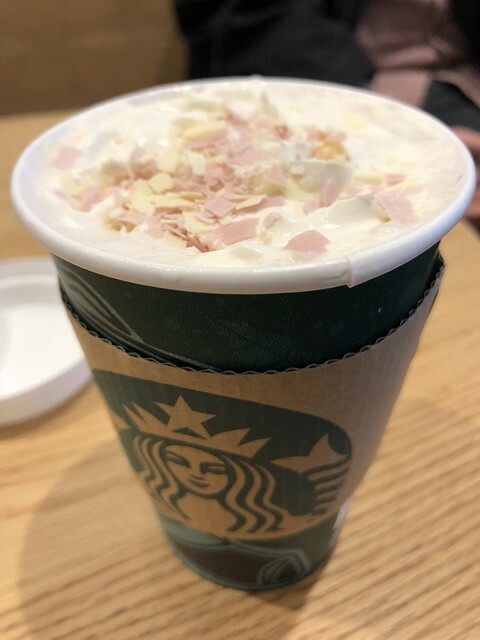 I treated myself to a cherry blossom latte. It's basically Japan's version of the PSL. Describing our visit to the Peace Memorial Park is hard. I keep finding myself saying it was "cool" or "really interesting" or a variety of other words with rather positive connotations. But it seems wrong to describe the site of the first nuclear bombing in that way. 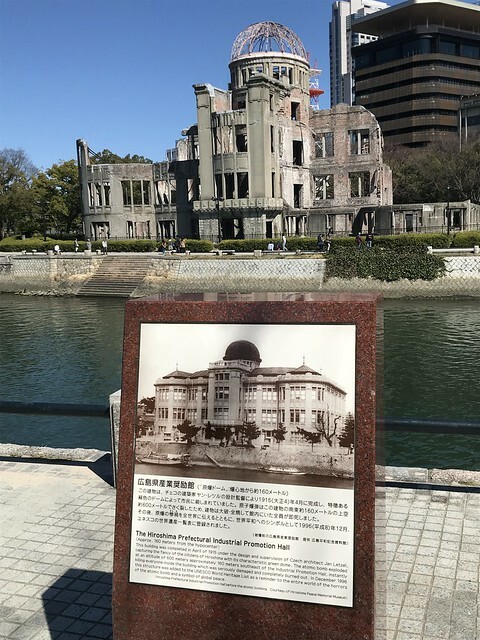 The museum in the park was tragic, especially the exhibit full of students' burned up clothes or women's dresses stained from the black rain. There was an old watched that's still frozen at the exact time the bomb exploded. 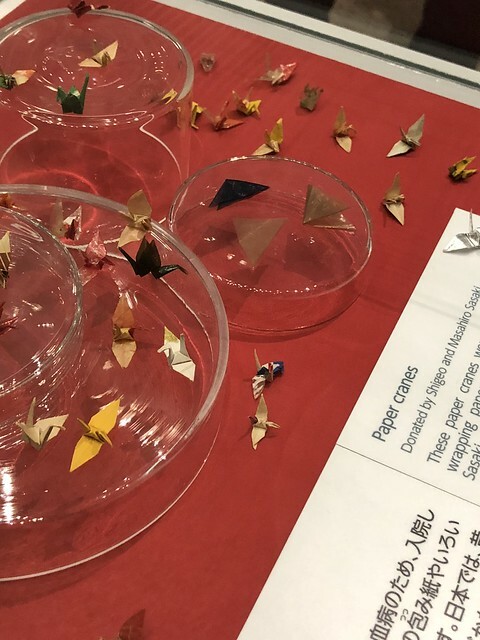 And in a small box were some of the thousands of paper cranes Sadako folded while she was hospitalized years later with leukemia as a result of the radiation from the bomb. 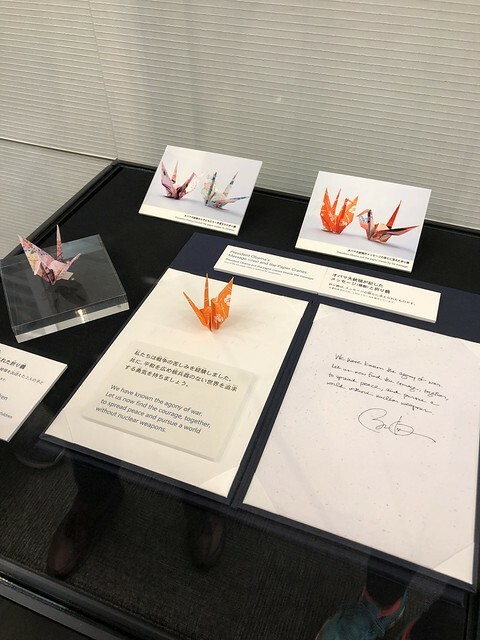 Downstairs in a special exhibit were the paper cranes President Obama folded on his visit. 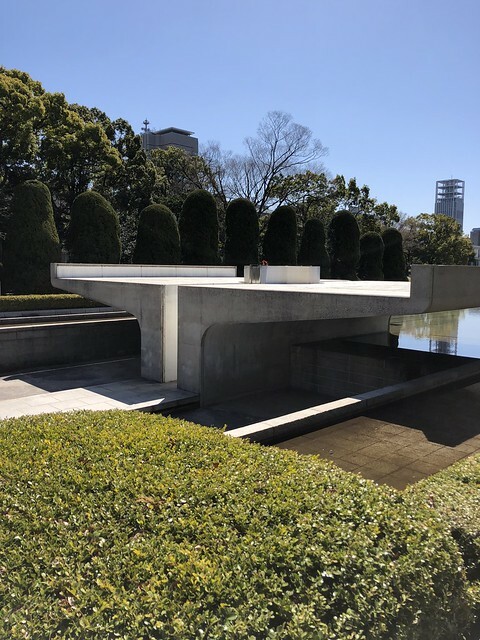 We spent a couple of heavy hours in the museum before we wandered through the rest of the park, which is full of memorials. 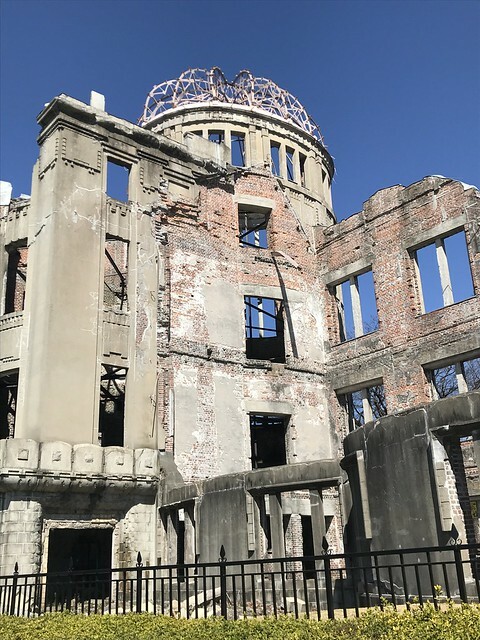 We saw the Flame of Peace, which residents of the city tell you will be extinguished when nuclear weapons are abolished from the world. 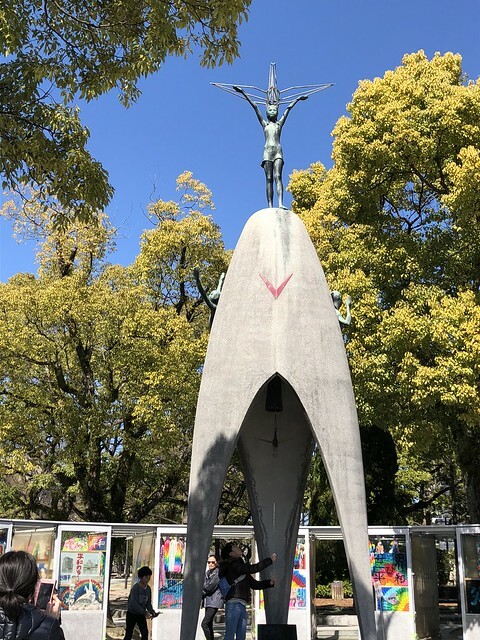 We stopped at the children's memorial, which features a statue of Sadako and a paper crane. 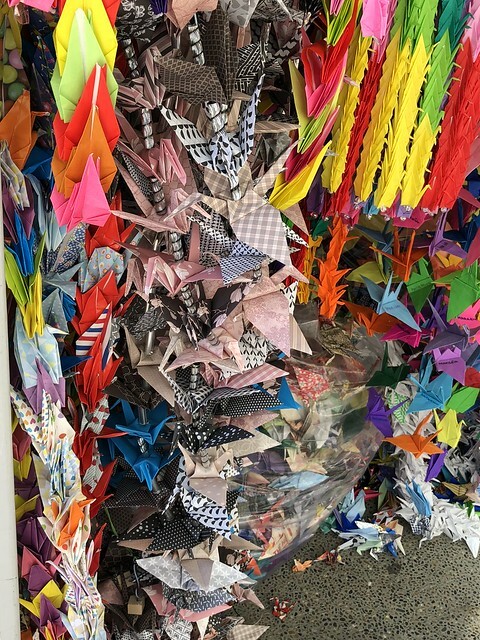 The memorial is also lined with clear glass boxes full of folded cranes left by visitors. 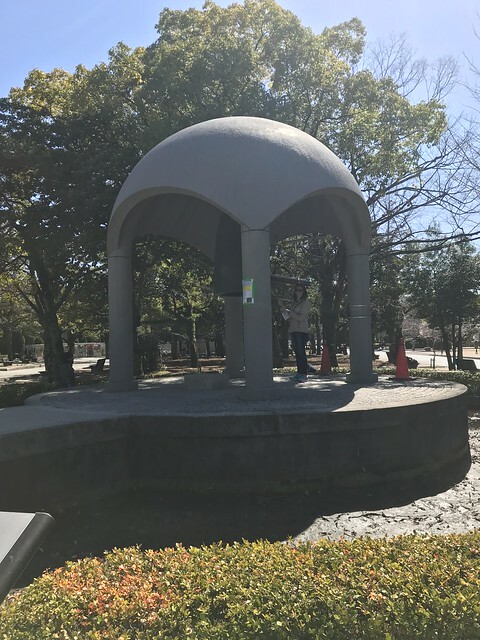 We stopped at some of the other memorials, and I ran the Peace Bell before we crossed the bridge for a closer look at the A-Bomb Dome. 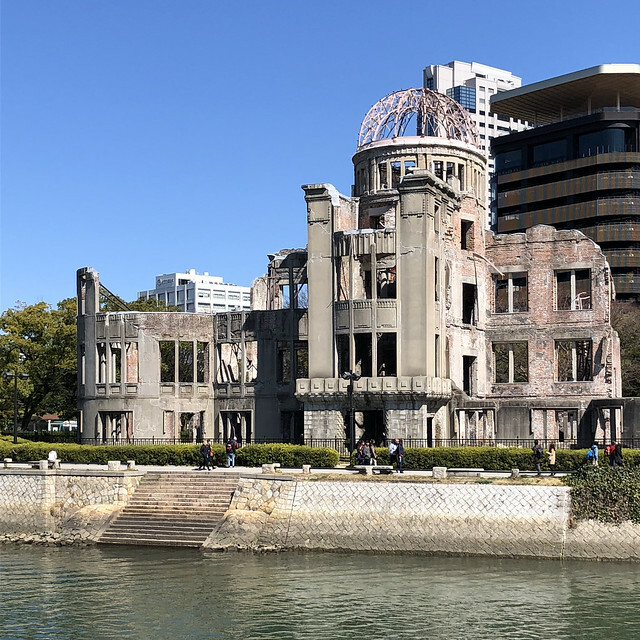 This building is now famous because a large chunk of its dome is still in tact after the explosion. The city has decided to preserve it so people can see the bomb's destruction. 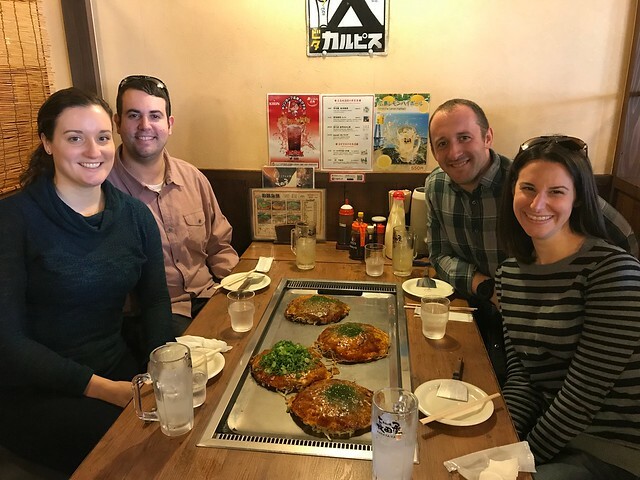 After starting the day with such heavy stuff, we decided to wrap it up eating some delicious Hiroshima-style okonomiyaki. Okonomiyaki is basically a Japanese-style pancake with all sorts of delicious stuff mixed in. I had them the last time I was in Tokyo, but the Hiroshima style is different because it mixes noodles in, and really if you add noodles to anything it makes it amazing. We ordered four different varieties and shared them around the table. They.were.so.good. Truly one of the best meals I had while in Japan. After we finished up with our late lunch, we hopped a train to take us to a ferry port to go to the island of Miyajima. I'll save our adventures there for another post, since it was probably my favorite part of the trip, and I've got a lot to say about it!